IO Expansion Shield For Arduino (V5) (SKU: DFR0088). RS485 interface. In the previous article, I reviewed several Arduino RS485 shields. Some of them are quite expensive, more than 20 USD. In this article, I tested one of Arduino RS485 shields, which costs about 3 USD. I ordered at Aliexpress IO expansion shield with RS485 interface and met with some problem while trying to run it. There is no description of the board at Aliexpress, unfortunately. I’ve found a description at the web site of one of the supplier. Since the test example published at the web site doesn’t work, I thought the problem with the board and had tried to determine the reason, checking by ohmmeter and drew connections line (in Microsoft PowerPoint 🙂 ) by red. It can be solved either removing IO expansion shield before “Upload” the sketch or removing right RS485 jumper, to remove connection to RX with MAX485 chip. 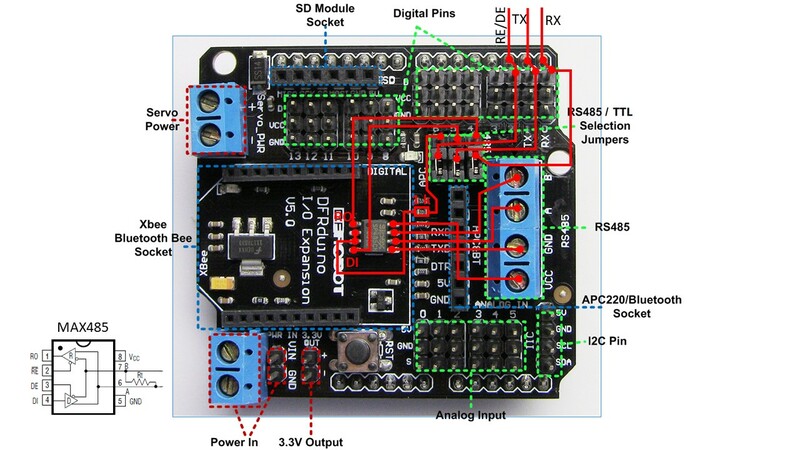 This entry was posted in IT Recipies and tagged Aliexpress, IoT, Modbus, RS485. Bookmark the permalink.